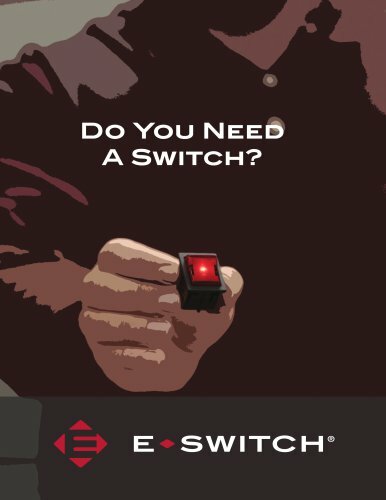 Catalogs > E-SWITCH > Do You Need A Switch? E-Switch Worldwide Headquarters: E-Switch Asia Sales Office: Address: 7153 Northland Drive N Minneapolis, MN 55428-1514 USA Phone: 763-504-3525 Toll Free (USA): 800-867-2717 Fax: 763-531-8235 Address: Gateway East, Level 28 152 Beach Road, Suite 38 Singapore 189721 Phone: +65 6827-5620 Fax: +65 6294-2602 Website: www.e-switch.com CALL NOW! to talk to an E-Switch engineer Brochure Version: June 2015 © 2015 E-Switch Inc. All Rights Reserved. E-Switch, Inc. is a wholly owned subsidiary of Stein Industries, Inc.